The Morakniv Basic 511 Carbon Steel Knife has an impact-resistant handle with a larger geometry that fits even better in your hand. The finger guard has been developed to optimize safety. The blade has a perfect balance between length and width, which gives a better experience when using the knife. The carefully chosen knife steel is hardened in Mora, Sweden according to a secret recipe. The blade is a high-quality carbon steel that is easy to re-sharpen. Carbon steel can be affected by moisture and corrosive environments, therefore make it a habit of wiping off the knife and use oil on the blade after each use. The Morakniv Craft Basic 546 Stainless Steel Knife has an impact-resistant handle with a larger geometry that fits even better in your hand. The finger guard has been developed to optimize safety. The blade has a perfect balance between length and width, which gives a better experience when using the knife. The carefully chosen knife steel is hardened in Mora, Sweden according to a secret recipe. The blade is carefully selected stainless steel that stays sharp for a long time and is the best choice when working in an outdoor environment. 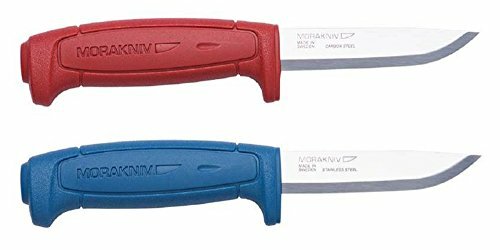 Morakniv Craft Basic 511 Carbon Steel Knife: Blade Thickness: 0.08 inches (2.0mm). Blade Length: 3.6 inches (91mm). Total Length: 8.11 inches (206mm). Weight: 3.9 ounces (110g). Most of the carbon steel knife models by Mora have unfinished spines. However, this will not affect the overall performance of the knife.